Dolman-Capsule Mash for Easter – Everything Your Mama Made & More! 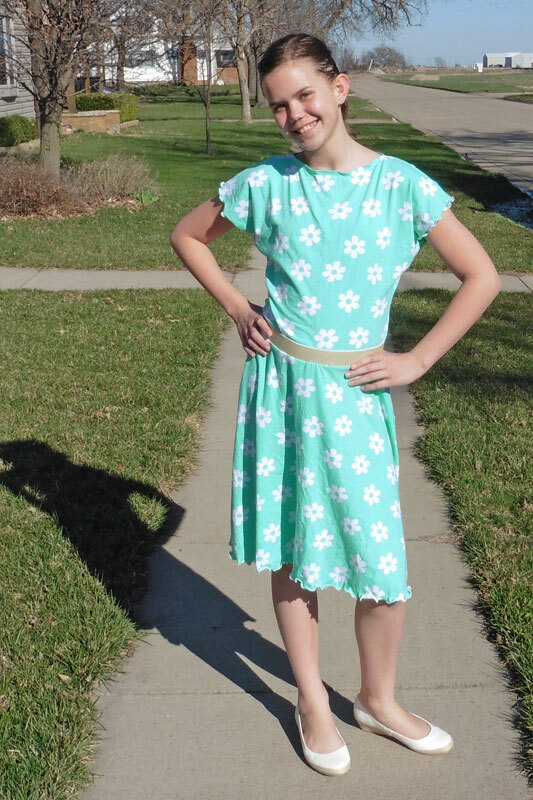 My oldest daughter fell in love with this white daisies on mint knit and begged for it to be her Easter dress. 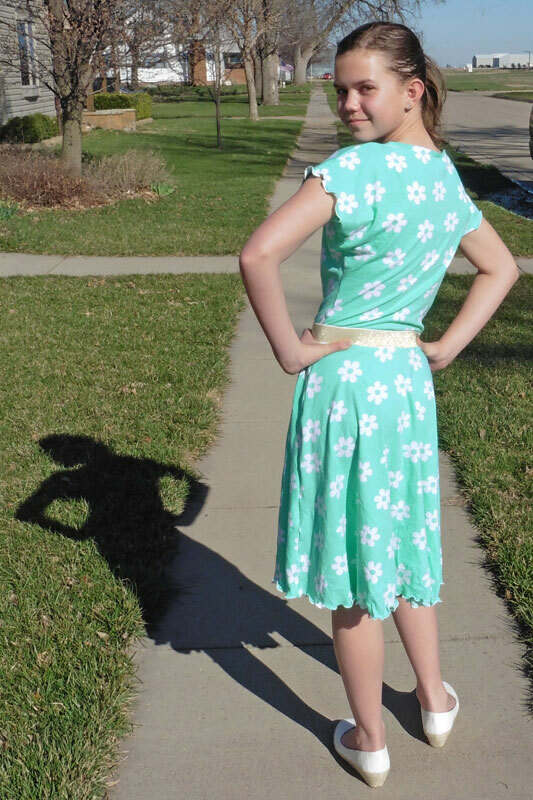 All I had was two separate yard(ish) long cuts from a bargain lot, so we had to get creative to make my tall girl a modest dress. Luckily, I knew the Girl’s Capsule Skirt would mash beautifully with Carlie’s Dolman Top! I made a similar dress for my best friend’s daughter back in January and used the same concept with the Women’s Capsule Skirt and Kymy’s Dolman Top to make myself a mini-dress in February. This time, I skipped the pockets (shh, don’t tell her that was an option!) to help speed up the project. I also used the elastic-as-a-faux-belt method when I attached the skirt to the top just to give the dress a little more oomph. For the faux belt, I cut a length of elastic (she chose a 1.75 inch wide sparkly gold) about an inch longer than the measurement around where it would sit just below her belly button. I used a lighter to heat seal the ends of the elastic so it wouldn’t fray, then overlapped the ends and sewed it into a circle. After assembling the skirt and the shortened top (skipping the skirt waistband and not hemming the bottom of the shirt), I pinned the elastic loop at the bottom edge of the dolman with the back of the elastic against the right side of the fabric. Then I put them (upside down) into the waistline of the skirt and aligned the raw edges of the skirt and top with the elastic sandwiched in between. It helps line it all up if you match the center fronts and backs and side seams (I placed my elastic overlap in the center back). Remember that if you use the longer back hemline of the Capsule Skirt that it needs to be against the back of the dolman! Sew around the waistline, making sure to catch the edge of the elastic in the seam, and then turn right side out and admire your new dress! So pretty, Joelle–the dress and your daughter. 🙂 It’s great to be able to sew sweet dresses for our girls–so hard to find “non-grown-up” styles for them in most stores nowadays. Yes! I love being able to make age-appropriate clothes … especially since she’s only 10 but fits into junior’s 7-9 and they’re usually geared even more toward too-revealing. The dress is awesome! Love the fabric and design. I’m also laughing with the pockets! I have one that does not get pockets on account I will find bugs in them….LOL YAY for tall girls too! 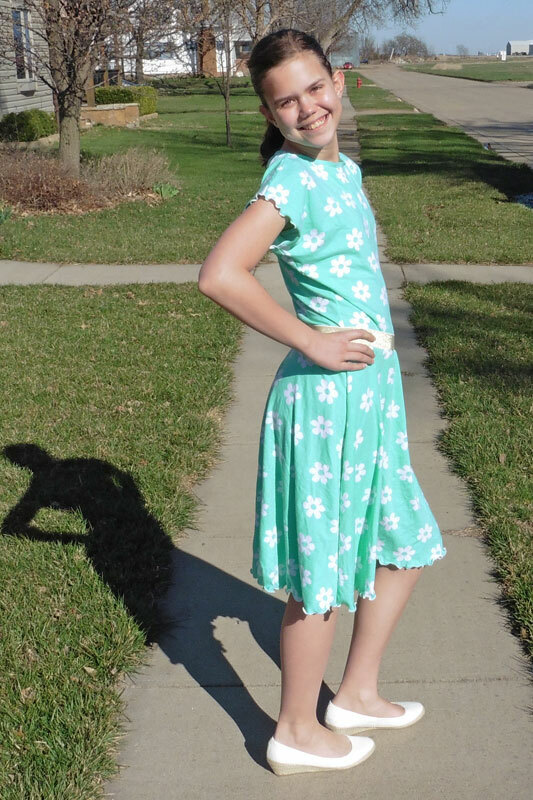 Carlie’s Dolman-Capsule Skirt Dress for a Teen – Everything Your Mama Made & More!